The graduate certificate program has been developed for working professionals and students in the health professions who realize they need additional training in order to better serve LGBT individuals in healthcare settings or by advocating for changes in public policy. Our program is currently not eligible for federal student loans. However, public and private partnerships fiscally support specialized training to better serve the health care needs of the LGBT community as well as a means to reduce health disparities worldwide. As a result of this support, we have developed our own highly competitive LGBT Fellowships and Grant Awards. Students enrolling in a modified 2-year completion track for the class enrolling Fall 2019 or Spring 2020 are eligible for merit- and need-based scholarships up to 100% of their tuition expenses. Fall classes begin online August 26, 2019. Spring 2020 classes start with the January residency on Friday January 17, 2020. There are two required 1-week residencies in Washington DC in July and January. Applications must be submitted by May 31, 2019 to be considered for this scholarship. 1) In order to be considered for funding through our program, U.S. Applicants must complete the FAFSA form online and forward the Student Aid Report to [email protected]. Please note that you will have to download the student aid report once your application has been processed, and forward this manually to us. Because our program does not qualify for federal student subsidized/unsubsidized loans, we will not receive your report automatically. While most programs do not offer international students financial assistance, the caliber of proposals received from previous international students in our cohorts has justified fellowships or scholarship support to international students. International students will also be considered for all scholarships. Please contact our office for the information required in lieu of a FAFSA. 2) Prioritization of awards funded will be based on excellence of capstone proposals (discussed during the interview), current LBGT community involvement or in health programs/projects designed to reduce LGBT health disparities, commitment to LGBT research and scholarship, and financial need. If you feel your FAFSA is not representative of your real financial need, you may submit a supplementary statement of financial need to be considered as part of your application via e-mail at [email protected]. 3) A scholarship review committee will use a rubric to score student’s application, letters of recommendation, statement of purpose, applicant interview, and Capstone planning document (completed prior to the interview) to determine priority for funding and awards. 4) Applicants for the 1-year completion track and the 2-year completion track starting in the summer will be notified of their scholarship awards by March 31st. Applicants for the modified 2-year completion track beginning in the fall will be notified of their scholarship awards by June 30th. 5) 1-year and 2-year completion track applicants for summer enrollment will have until May 1st to affirm enrollment in the LGBT Health Policy & Practice Graduate Certificate program and acceptance of the award contract. Modified 2-year completion track applicants will have until July 15th to affirm enrollment for the Fall and accept the award contract. This year as last we anticipate awarding two full-tuition scholarships funded by the AIDS Healthcare Foundation (AHF). In order to be considered for these competitive awards, applicants must demonstrate exceptional promise for fulfilling the program’s mission and potential for impact on current LGBT health disparities, and/or research or practice in HIV/AIDS and other sexually transmitted diseases. All applications for the one-year track received by February 15 will be considered for these scholarships. No special action is needed. We will also award several partial scholarships of $1,000 to $5,000. Funds available will be allocated on the basis of both merit and need. Our program does not qualify for federal student loans. Because of this, we encourage prospective students to apply for other external scholarships to fund their education. 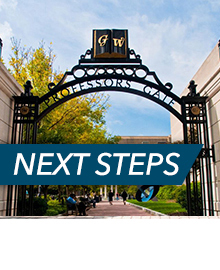 The military and veterans affairs office at GW will apply GI Bill Education benefits to the graduate certificate program. Eligible students may be able to use a Segal Americorps Education Award - a post-service benefit received by participants who complete a term of national service in an approved AmeriCorps program-(AmeriCorps VISTA, AmeriCorps NCCC, or AmeriCorps State and National) - toward the cost of their tuition. Teach for America members can also apply for the Americorps Education Award during one or both of their years as a member as long as they meet citizenship and service term requirements. Individual use of these awards will depend on eligibility, and in some cases, awards may not be applicable due to the nature of our program as a graduate certificate and not a Master's program. Awards must be processed through GW's Office of Student Accounts, not the Financial Aid office, so please contact GW's Student Accounts Office and visit the AmeriCorps website for more information. Two awards are available each year. Master's recipients are only eligible for tuition awards and may hold the fellowship for two years; doctoral students are eligible for any of the three awards and may hold the fellowship for three years. Visit the Office of Graduate Scholarship and Fellowships website for more information. The MSI Award provides qualified individuals, from eligible institutions, who seek admission in a Columbian College graduate program, an application fee waiver and a tuition award of at least 40%. For more information and to see list of eligible institutions click here. be enrolled in a Columbian College graduate program to receive the tuition benefit, renewable for the normal duration of the degree. Employer Tuition Assistance is often available through Human Resources departments in non-profit and for-profit organizations. We encourage working applicants to inquire about tuition benefits through their employers. Federal employees (e.g., HHS, HRSA, SAMHSA, CDC, NIH, etc.) may also have access to tuition support and professional development funds. Employees of The George Washington University may also be eligible for employer tuition assistance. Amounts, policies, and procedures vary by division, so ask your supervisor or HR for guidance on obtaining tuition benefits. We will work to tailor your Capstone project to your employer's needs. For example, Dr. Sharon Glezen's Capstone project matched Sharon's interest to her employers needs. Sharon redesigned the first year medical school curriculum in LGBT health at the University of Rochester Medical School. Another example, Dr. John Cullen developed a plan to lobby the University of Rochester to provide transition-related coverage to for transgender patient member of the student and employee health benefits plans. Prospective students are encouraged to explore outside scholarship and funding resources. Below are some helpful links with more information about organizations which provide scholarships for LGBT and ally students. The Pride Foundation offers students who are residents of Alaska, Idaho, Montana, Oregon, or Washington (but may be studying elsewhere) eligibility for their scholarships. More information can be found here. The Point Foundation funds individual LGBT graduate and undergraduate scholars through an annual competitive process. Point only funds students enrolled in terminal degree programs (e.g. Masters, Doctoral, Medical) but financial awards can be applied to GW tuition expenses if dually enrolled in the certificate program. More information can be found here. The STDcheck.com HIV-Positive Scholarship awards scholarships ranging from $250-$5,000 to eligible HIV-positive students who apply. There is no deadline as they are reviewed and awarded monthly-- for the current or following semester, depending upon individual institution's financial aid deadlines. More information about how to apply for this scholarship can be found here. The National Organization of Gay and Lesbian Scientists and Technical Professionals provides a $5000 Out to Innovate™ Scholarship for LGBTQ+ and active ally students pursuing degrees in STEM programs. The application process opens in April of each cycle. Application submission deadline for each cycle is the first Saturday of June. More information can be found here. The Human Rights Campaign maintains a database of scholarships for LGBT scholars across the country, sortable by region. More information can be found here. The Center for Population Research in LGBT Health at the Fenway Institute has a database of scholarship opportunities for graduate students. More information can be found here. The non-profit group FinAid.org maintains a webpage of LGBT scholarship opportunities. More information can be found here. The Campus Pride National Scholarship Database provides LGBT and ally students with the most comprehensive list of scholarships and funding resources at both the undergraduate and graduate- levels. More information can be found here. Applicants may also come across other opportunities by conducting a web search of their own. Student loans are available from non-governmental lending institutions, independent of the federal student loan program. Unfortunately, the subsidized Federal Stafford Loans are not available for graduate certificate programs. Our financial aid office will provide the necessary paperwork to secure student loan rates at commercial banks. To apply, click here (In the application, please click Summer 2016).